For the measurement of lipid peroxidation in plasma, serum, urine, tissue homogenates, and cell lysates. Oxidative stress in the cellular environment results in the formation of highly reactive and unstable lipid hydroperoxides. 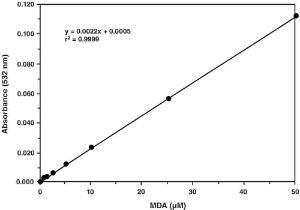 Decomposition of the unstable peroxides derived from PUFAs results in the formation of malondialdehyde (MDA), which can be quantified colorimetrically following its controlled reaction with thiobarbituric acid. The measurement of these 'Thiobarbituric Acid Reactive Substances' (TBARS) is a well-established method for screening and monitoring lipid peroxidation. Modifications of the TBARS assay has been used to evaluate a wide range of samples that include human and animal tissues and fluids, drugs and foods. 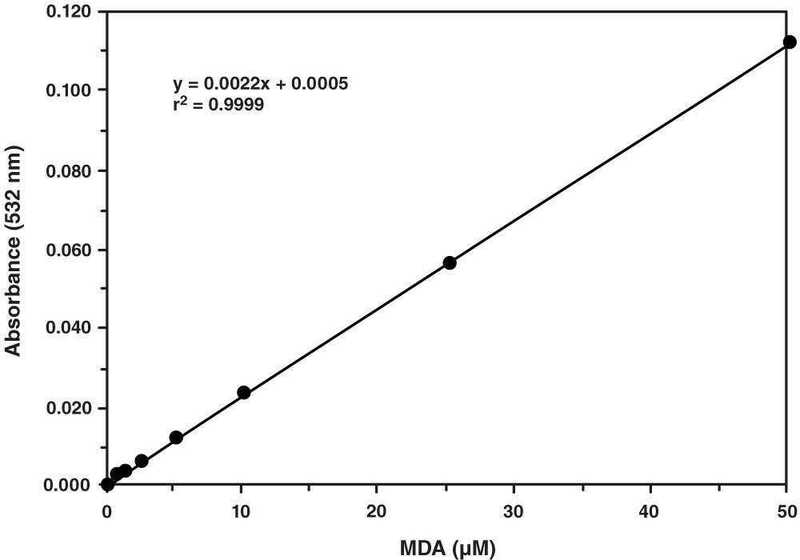 Even though there remains a controversy cited in literature regarding the specificity of TBARS toward compounds other than MDA, it still remains the most widely employed assay used to determine lipid peroxidation. Cayman’s TBARS Assay Kit provides a simple, reproducible, and standardized tool for assaying lipid peroxidation in plasma, serum, urine, tissue homogenates, and cell lysates.